This conversation about how to survive a cold is sponsored by Vick’s available at Walmart. All opinions are my own. Surviving a cold would be simple if all we had to do was lie in bed, drink hot tea, and nap. Wouldn’t it be lovely if we could just take a whole week off from work and pamper ourselves so we recovered quickly? While it’ important to take a sick day when you need it, sometimes you have to power through your cold symptoms and get things done. Especially during the chaotic holiday season. 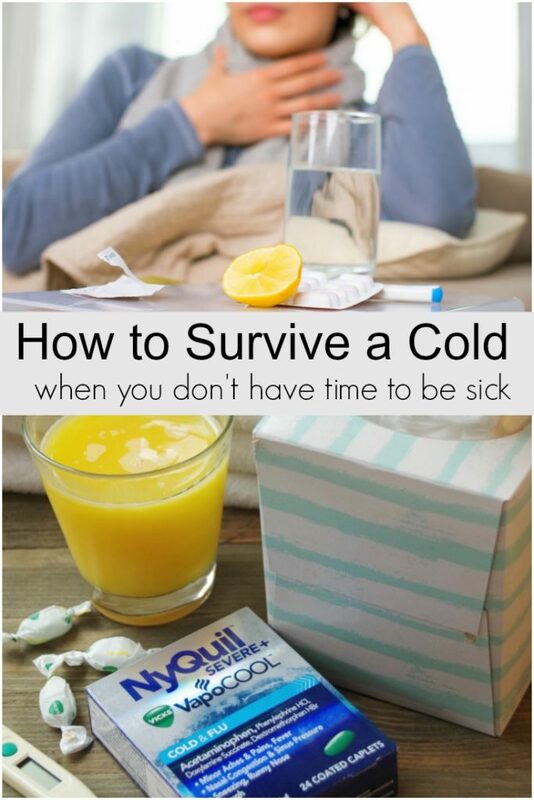 I thought I would share a few of my tips on how to survive a cold when you are just too busy to be sick. Feel a cold coming on right now? Use Walmart Online Grocery Pickup to order your Vicks products! Keep reading for some great ways to save on Vicks at Walmart and tips to survive the holiday chaos when you are sick. How do you avoid getting sick when living with a sick person? In order to stay healthy, wash your hands frequently and keep them away from your face. Get more sleep, eat healthy, and take your vitamins. Keeping your immunity strong is important. What cold symptoms are common? Here are a few common cold symptoms: Sore throat, Runny nose, Coughing and sneezing, Watery eyes, Headache, Fatigue. Use cold symptom relief products like those from Vicks to relieve symptoms fast! Should I stay home if I have a cold? Ideally, yes. It would be nice, right? However, it isn’t always possible. Stay home if you CAN for a day or two. Or, just minimize your outings. Only do what you HAVE to do and minimize how many people you come into contact with. Choose Walmart Online Grocery Pickup and pick up your items without having to actually shop in store. Simply place your order at grocery.walmart.com, select your pickup time, and then your order is brought out to your car when you arrive. It is a great way to get your cold medicines without having to get out of the car! How long will my cold last? Most colds last between 7 and 10 days, however, this varies considerably. Vick’s products provide relief from cough, cold, and flu symptoms. Plus, they offer products with new VapoCool, which provide a rush of Vick’s vapors. There are lots of ways to save money on Vicks products at Walmart! 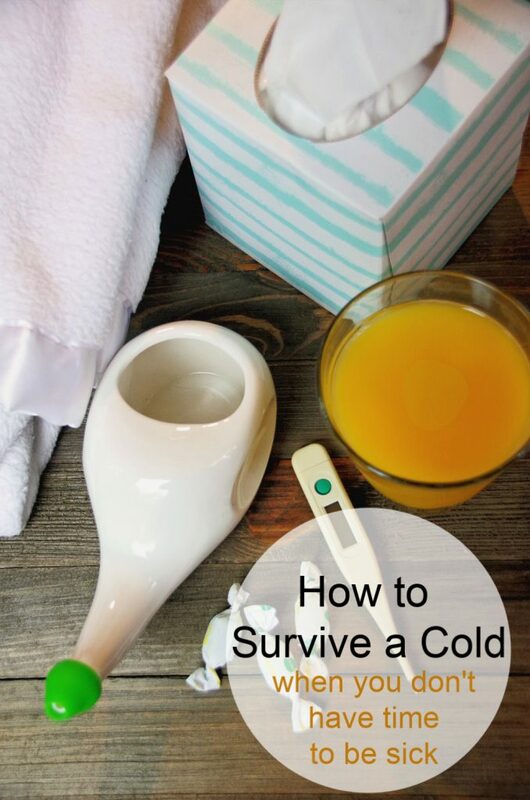 If you are wondering how to survive a cold, I definitely recommend stocking the medicine cabinet ahead of time so you are prepared for your next cold! Download the iBotta app and check the newspaper for coupons. Head over to the Walmart site for great deals on Vick’s products. Catnap to re-energize: Cat naps, quick power naps, are a great way to re-energize yourself when you are sick. Stay hydrated: Staying hydrated helps keep mucus thinned out and replaces all those fluids you lose as you blow your nose all day. Take a hot shower The heat from your shower can go a long way towards soothing achy muscles and the steam will help clear up your head congestion. Eat ice chips. If your throat hurts, ice chips may help with soreness and pain. Watch what you drink: Avoid coffee, caffeinated sodas, alcohol and energy drinks. Soothe aches and pains with over the counter products Sometimes, you need to delve into your supply of pain killers and over the counter symptom relief to power through a cold! 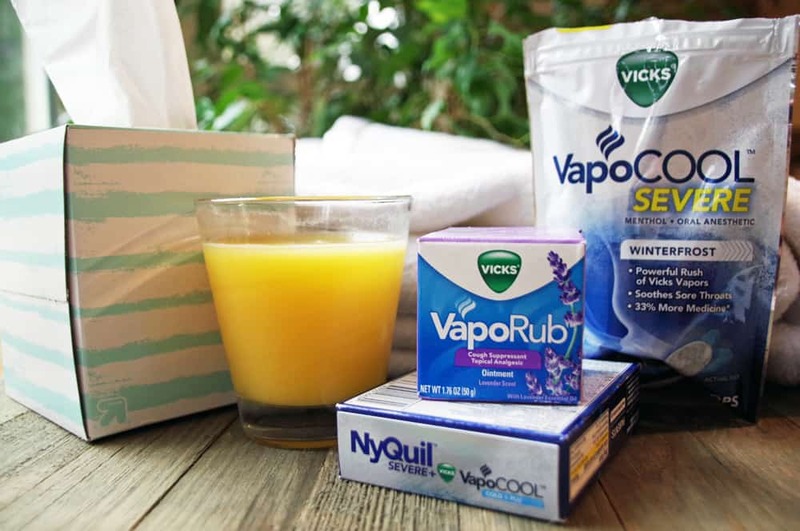 Stock up on Vicks products like Vicks VapoDrops, Vicks Nyquil, and Vicks VapoRub. Still sick? Call your doctor. If you’ve been sick for 7 days and you’re not getting better — or if you’re getting worse — it might be time to call the doctor. Surviving a cold would be easier if we weren’t so busy. Unfortunately, we live in the real world. Where kids have Christmas plays and moms have bills to pay. Make sure your medicine chest is well stocked before you need it! Have any other tips for surviving a cold this year? This is a sponsored conversation written by me on behalf of Vicks at Walmart. The opinions and text are all mine.